Timberwolf's Sequoia Standard Harness is made from the same soft braided webbing as their Sequoia collars. The straps are soft with rounded edges to prevent chafing. This Roman-style harness is available in nine colors and five sizes to fit dogs with chests 10-40" around. Timberwolf has been around since 1996, their braided collars and leashes have a reputation for lasting forever. It turns out they make harnesses too! Their Standard Harness is indeed a standard harness, with a buckle on the right side. 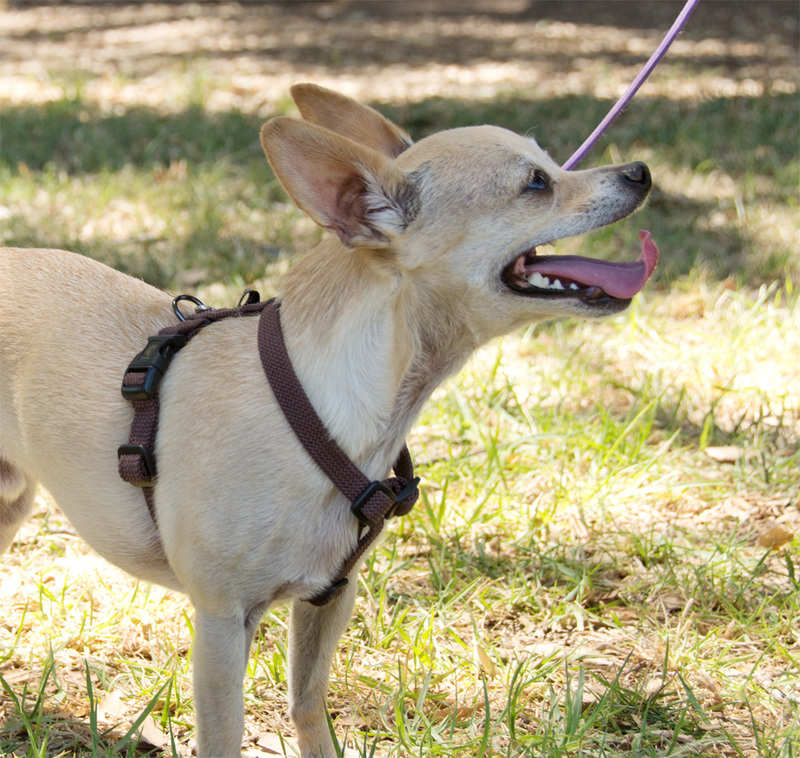 The dog's left front leg must be lifted over the belly strap when putting the harness on. This is a classic design, it allows total freedom of movement while staying in place. However, Timberwolf's version is made from soft tubular braid so it's easy on the coat and skin. This is a harness with a ring at the front, so it can be used as a front-attachment no-pull harness as well. This harness wears well, and washes up nicely. Pros: Soft and comfortable for all-day wear. Light and breathable. Easy on delicate coats and sensitive skin. very adjustable, allows full range of shoulder movement. Comes in lots of colors! Cons: Sizing runs a little bit small. Ru has a 12" chest, and you can see the 10-14" harness is adjusted out nearly as far as it goes. I'm not sure if this is true for the larger sizes. Bottom Line: It's not trendy, fancy, or super technical, but this simple harness will last just about forever, and look good the entire time.